We would like to tell you all about our team. Ellie: We are the Eco council and we help the environment, animals and people in and around our school to learn about the Environment and how we can protect it. Zoe: We are made up of 2 children from each year group. Kieron: We have all been chosen and voted in by our friends in our class to represent their thoughts. George: We help spread the word about helping the environment. Olek: We like to help animals because they can get ill and poorly because of litter. Alexandra: This year we have had meetings to discuss how to help our school. 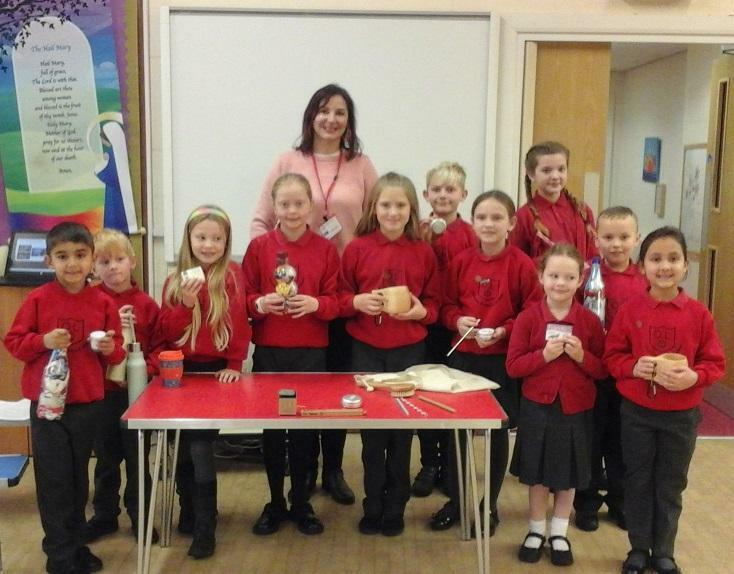 Masie: We organised and set up a bring and buy sale raising over £90. Katie: We have led an assembly to teach people about the problems of plastic in our seas and oceans. Issy: We taught the school how they can reduce the plastic that they use. Seren: We are holding a competition to turn plastic into a craft model. Bea: If you have any ideas find a person with an Eco Badge on and they can bring your ideas to our next meeting. DO IT FOR DAVID PROJECT WORKSHOP Mandy Price from the Do It For David Project did a workshop in school recently. She showed us how to make ecobricks by using plastic bottles and wrappings and left the following instructions for us to share with you. The Eco team for 2017/2018 are Bryn and Tilly from St Therese, Autumn and Robin from St Martin, Issy and Maisie from St Anthony, Annie, Freya, Kieran and Arthur from St Francis & St Bernadette. So far this year the Eco Council have planned and led an assembly to teach the whole school all about the importance of recycling and how to recycle correctly. They have met with Ray Hughes, the Active Travel and Road Safety Officer from Shropshire Council to discuss road safety and being seen in the dark. The Eco team then organised a Be Bright Competition with prizes for children who designed striking clothing to wear at night to be seen in the dark.